We are the top auto recycler in Raleigh NC! We recycle more cars than anyone in the Raleigh area. We are a family owned and operated auto salvage business. We have a huge salvage yard allow us to offer FREE towing when you sell your vehicle to us. We are located in south Raleigh and are looking to recycle your vehicle today. We also offer charity car donations and will pick-up your old car for free and offer a cash payment on the spot. We ensure that your vehicle is disposed of properly and in an environmentally conscious manner, meeting and exceeding all legislated requirements. Let us handle your vehicle that has come to its end of life. Your car has many recyclable parts that can be used for other purposes including making new cars! All hazardous fluids are removed and the remainder of the vehicle is recycled. Battery, Glass, Rubber Tires, Plastics, Carpets and Electrical parts can all be recycled! 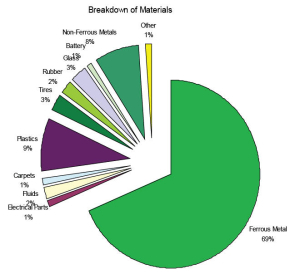 Around 75% of the average car is made up of metal! Imagine if every vehicle was recycled and not end up harming the environment! Aluminum can be recycled more than once and does not lose quality. Using aluminum recycling improves waste prevention and saves natural resources! This is a Win-Win, cash in your pocket while saving the environment! How great is that! Give us a call today to sell your old vehicle!